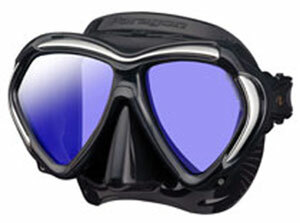 Introducing the new advanced M2001SQB Paragon professional divers mask. The new Paragon mask offers Tusa's NEW Reinforced TRI-MIX frame, Freedom Technology with Fit II, and the UV 420 Lens Treatment with AR and Crystal View Optical Glass which helps you dive with eye protection and ultimate clarity. Constructed of three materials that make it both lightweight and durable. Varied thicknesses on the skirt increase both comfort and performance. The lens blocks high-energy light by absorbing it while also sitting closer to the face for a broader field of view. The five-angle buckle is positioned higher and sits directly on the skirt to reduce friction for a better fit.